Lotte Koala’s March Cookies: The Same As Hello Panda? 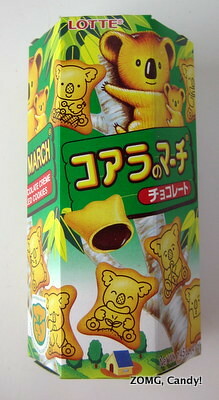 Lotte Koala’s March Cookies are “chocolate crème filled cookies” that can be found in Asian grocery stores in America. I recently got a free box from the folks at MunchPak, along with Koala’s March competitors Hello Panda (which I reviewed already). In fact, those two candies are very similar; I’ll explain. 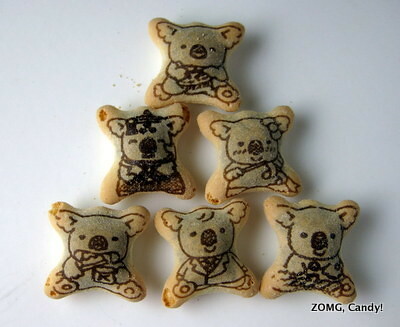 The pillow-shaped cookies are imprinted with adorable pictures of koalas (instead of pandas) in various garbs and doing different activities. The biscuit portion was dry, crunchy, and airy, with just the barest hint of sweetness. 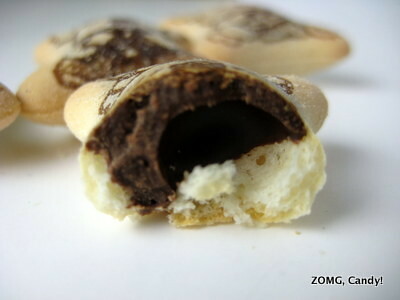 Each hollow cookie had chocolate in its center. Though it was depicted as limpid on the package, the chocolate filling wasn’t quite so fluid in reality. Instead, it was softer than solid chocolate but not quite a ganache, and it tasted of lightly semisweet chocolate. The mix of crunchy plain biscuit and semisweet soft chocolate was quite tasty, and it was fun to look at the different koalas and try to guess what they were doing. 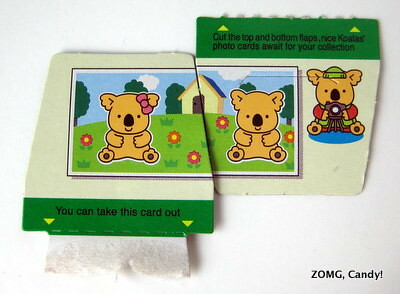 Where is the be-suited koala off to, I wonder? An OM. They are just about the same as Hello Panda – just choose the animal you like more! Sasha Chocolate For Matcha Lovers? !